nativ.ly helps Skype promote a heartfelt brand video on Upworthy. Upworthy, recently described as the “Fastest Growing Media Site of All Time” by Fast Company, is social media with a mission: to make important stuff go viral. 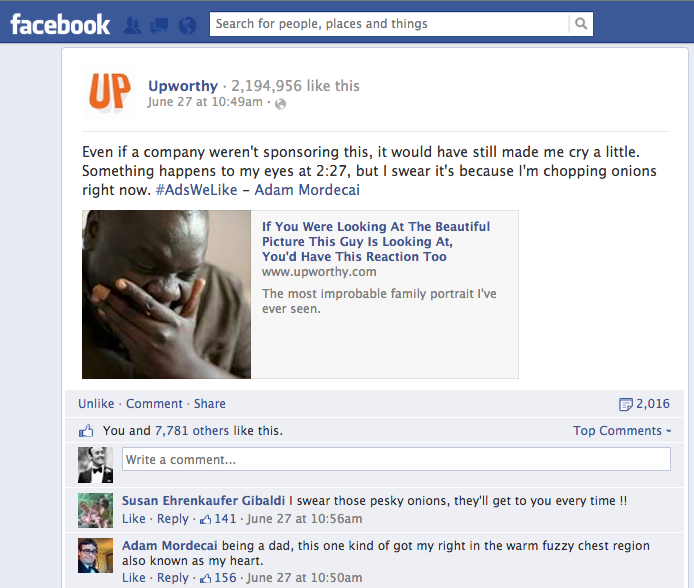 Everything on Upworthy.com is both meaningful and shareable. A “steady stream of the most irresistibly shareable stuff you can click on without feeling bad about yourself afterwards”. Skype, in partnership with their award-winning advertising agency, Pereira & O’Dell, recently created a series of videos profiling incredible stories about how families are using Skype to “stay together”, even when they are continents apart. When Pereira & O’Dell showed nativ.ly the touching video about Denis, a Ugandan man pursuing his dreams in America who uses Skype to stay connected with his family eight thousand miles away, we had a feeling this was exactly the type of substantive brand content that could be promoted natively on Upworthy. Upworthy agreed that, while this video was clearly an ad for Skype, it was also a beautifully told, shareable, story that brought attention to an important issue (what’s happening in Uganda). They offered Skype the opportunity to be the first partner to take advantage of Upworthy’s new “Ads We Like” paid promotion program. Upworthy promoted Skype’s video with the same effective recipe that they apply to any content that they think is both meaningful and shareable (the definition of “Upworthy”). A curator tested different headlines until they were confident that they had one with the best chance of maximizing “virality” and then they distributed it to their passionate community (featuring it on Upworthy.com, as well as sharing it with their large followings on Facebook and Twitter.) As Upworthy predicted, their audience was touched by Denis’ emotional story and they shared the video widely. nativ.ly has been described as a “matchmaker” who helps the right brands and startups find each other. Well, Patti Stanger eat your heart out, because Skype’s Denis video and Upworthy are a match made in (Internet) heaven!